The first is the African Court on Human and Peoples’ Rights (African Human Rights Court), established in terms of the Protocol to the African Charter on the Establishment of an African Court on Human and Peoples’ Rights (African Human Rights Court Protocol). This Protocol entered into force in 2004, making the African Human Rights Court, located in Arusha, Tanzania, the only regional (or ‘continental’) Court that exists in Africa today. Its first set of 11 Judges was elected in 2006, and this Court has already given a number of judgments, notably an order for provisional measures against the erstwhile government of Libya. The second judicial institution is the African Court of Justice, which was foreseen in the AU Constitutive Act, and established under the 2003 Protocol establishing an African Court of Justice. Its role would have been to adjudicate matters related to economic integration and matters of a political nature, such as border disputes. Although this Protocol has in fact been ratified by the required 15 AU member states, this Court has not – and will in all likelihood never – be put in place (or ‘operationalised’) by the AU. The African Court of Justice may rightly be described as ‘still-born’, despite the fact that the Protocol establishing this Court entered into force on 11 February 2009. The explanation why the AU is not bringing this Court to life lies in the political agreement to merge the two first courts into a single, merged institution, rather than to create two separate institutions. This merged court, to be called the African Court of Justice and Human Rights (the Merged Court), will be established under the 2008 Protocol to the African Charter on the Establishment of the African Court of Justice and Human Rights (Merged Court Protocol). Fifteen state parties need to ratify this Protocol to secure its entry into force. Thus far, only three states have become a party to this Protocol, indicating that the political will to set up this Court has been lacking. Once established, the Merged Court will be comprised of two separate sections, one dedicated to ‘general affairs’, and the other to ‘human rights’. In the interim, the AU initiated a process to add the competence to deal with individual criminal responsibility to the jurisdictional scope of the anticipated Merged Court. A new legal instrument, the Protocol of Amendments to the Protocol on the Statute of the African Court of Justice and Human Rights(Amending Merged Court Protocol) has been prepared by the AU Commission, with some expert advice, and is the one now under consideration. As the main change to be brought about to the Merged Court, as envisaged, is the addition of a third section to deal with international crimes in Africa,this fourth judicial institution is here referred to as the ‘three-section’ or ‘tri-sectional’ ‘Merged Court’ or ‘Amended Merged Court’. Although the potential effect of the Amending Merged Court Protocol on human rights in Africa has thus far not been highlighted very prominently, or appreciated sufficiently, it is indeed a matter of great concern. When the changes to the human rights landscape, potentially brought about by the Amending Merged Court Protocol, are considered, the starting point from a human rights perspective should bethe following: Changes to the current contours of the landscape should not undermine the progress made or overturn the gains achieved to date under the African regional human rights system. Any changes that inhibit or in any way restrict the extent of current access to vindicate human rights in AU member states would amount to an unacceptable diminution of the status quo. The current position on access to human rights may be characterised in terms of three scenarios. The first scenario is that prevailing in the 53 AU member states, which have all become state party to the African Charter on Human and Peoples’ Rights(African Charter). Individuals or NGOs in all these states may approach the African Commission on Human and Peoples’ Rights (African Commission) with complaints, provided that they have exhausted local remedies. Under the second scenario, which applies in the 26 states that have ratified the Protocol establishing the African Courton Human and Peoples’ Rights (African Human Rights Court), individuals and NGOs may bring complaints to the Commission, after which the Commission may decide to refer these matters to the African Human Rights Court. In this way, indirect individual access to the African Human Rights Court is possible in almost half of the AU member states. Although the flow of cases from the Commission to the Court has been very slow, this avenue promises redress before a judicial body – the African Court – giving binding decisions, rather than the African Commission, a ‘quasi-judicial body’, which is allowed only to make recommendations to states. Under the third scenario, which applies in the five countries (Burkina Faso, Ghana, Malawi, Mali, and Tanzania) that have made optional declarations under article 34(6) of the African Human Rights Court Protocol currently in force, individuals and NGOs may send their complaints or cases directly to the African Human Rights Court. In these five countries, individuals may vindicate their rights directly before the African Human Rights Court, once they have exhausted domestic remedies. Although only five state parties to the African Human Rights Court Protocol have as yet made this optional declaration, states parties to the Protocol may at any stage do so. 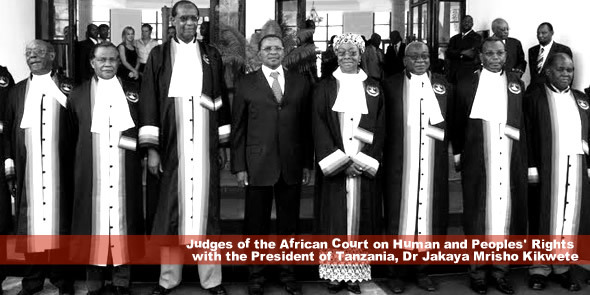 As far as the current situation is concerned, a distinction should be drawn between the African Human Rights Court, which in fact exists at present, and the envisaged Merged African Court, set to bring together the African Human Rights Court and the African Court of Justice, foreseen under the AU Constitutive Act. Although the Merged Court does not yet exist, it is likely to come into existence, and should be the yardstick against which any amendment should be assessed. In addition to these three scenarios, there are also possibilities within states that are members of the regional economic communities (RECs), for individuals to submit complaints to the judicial institutions created under the treaties establishing these RECs. Foremost among these, individuals and NGOs in the Economic Community of West African States (ECOWAS)may approach the ECOWAS Court directly with their complaints of human rights violations. These individuals or NGOs do not have to exhaust local remedies first and may bring their cases based on the African Charter. There are a number of reasons why the proposed amendments, as set out in the Amending Merged African Court Protocol, would amount to a deterioration of the current avenues of human rights access and thus the extent of human rights protection in Africa. What are the main changes brought about by the Amending Merged Court Protocol, in its current guise? In the main, a third section (the ‘International Criminal Law Section’) is added to the General Affairs Section and Human Rights Section, envisaged under the Merged African Court Protocol. The main concern with this additional section is that two very disparate judicial entities are integrated into one. On the one hand, the ‘general’ and ‘human rights’ sectionsdeal with state responsibility and accountability in respect of inter-state disputes and human rights violations. On the other hand, adding criminal jurisdiction foresees the establishment of a court dealing with individual criminal responsibility. Let it be clearly stated: Such an amalgamation of functions and mandates is unprecedented under international law. In our view, there are good reasons why such distinct functions have never before been merged into a single judicial entity or organ at the international level. For one thing, there are major differences between courts dealing with state responsibility and those dealing with individual criminal responsibility. The first set of courts make findings about state responsibility, while a court dealing with criminal justice makes a finding about individual guilt. Another difference is the very different evidentiary standards that apply. While state responsibility is determined with reference to the standard of a balance of probabilities, the standard in an international criminal tribunal is that of ‘beyond reasonable doubt’. While cases of state responsibility or accountability for human rights violations are generalised and would not necessitate a level of seriousness, the prosecution of crimes would almost inevitably be ad hoc and be reserved for the most serious cases where a very high threshold of seriousness had been reached. There are a number of further reasons why the amendments would lead to a reversal in the accomplishments in respect of human rights, related to the fact that the Amending Merged Court Protocol would create a position in which stateshave to decide afresh whether to become party to the Protocol. Faced with a clean slate, previous commitments to any of the prior Protocols would count for nothing. The first consequence of the need for a new political decision to ratify is that states would be faced with an all-or-nothing option. An all-or-nothing requirement may well be a disincentive for some states to ratify a protocol creating a section with jurisdiction over serious crimes. When it is faced with an all-or-nothing choice, astate that would be attuned to the protection of human rights or its obligations under the ICC Statute, may decide not to ratify the Amending Merged Court Protocol at all, due to its reticence to accept a court that deals with international criminal justice issues. The second possible consequence is that states that have had an unfavourable experience with the African Human Rights Court may have second thoughts about their initial acceptance of the Court, and may for this reason desist from ratifying the Amending Merged Court Protocol. However, article 6 of the present draft addresses this issue by preserving the prior-acceptance of the jurisdiction of the African Court of Human Rights and African Court on Justice and Human Rights. If draft article 6 is adopted in its present form, a state would therefore not be in a position to ‘undo’ its ratification of either the African Human Rights Court or the Merged Court Protocol. Another potential negative consequence of the introduction of a tri-sectional judicial institution is the likelihood of the reduction in the focus on and prominence of human rights. This tendency of eroding human rights prominence has already manifested itself in the reduction of the number of judges with a particular human rights competence. In the current African Court, there are 11 judges. In the Amending Court Protocol, the Human Rights Section of the Merged Court would have eight judges. In the latest amending version, the three-sectioncourt will have of only five judges out of a total of 16 judges with a particular expertise in human rights. It is also inevitable that the limited resources, available to the AU, would be spent on the more prominent issue of criminal justice. It should be kept in mind that the cost of one criminal prosecution may far exceed the cost of the budget of the African Human Rights Court. The merging of the three discrepant sections would have the effect of inevitably seeing resources being allocated disproportionately towards criminal justice cases rather than on cases dealing with human rights. A related concern is the possibility that decisions of the Human Rights Section may be overturned on appeal by an Appellate Chamber not well versed in human rights matters. The Amending Merged Court Protocol stipulates that the ‘Appellate Chamber may affirm, reverse or revise the decision appealed against’, without restricting these decisions to either ‘general’, ‘human rights’ or ‘criminal law’ matters. The only ‘Appeal Chamber’ mentioned in the Protocol is the ‘Appellate Chamber of the International Criminal Law Section’, thus creating the impression that this Chamber – consisting of Judges elected with expertise on international criminal law — would also hear appeals about human rights matters. It should further be recalled that the rationale for creating the Merged Court(the African Court of Justice and Human Rights),rather than two separate courts (the African Human Rights Court and the African Court of Justice), was the saving of resources. In 2004, President Obasanjo convinced his fellow heads of state that the two courts should be merged into a single institution, in order for expenses to be minimised, for example through establishing a joint library and a joint registrar. The imperative for the merging of the two courts was to reduce expenses, given the limited resources of the AU. However, concern for cost seems now to have taken a back seat. Comparative experience shows that international criminal courts are extremely costly. For example, the 2006-2007 biennial budget for the International Criminal Tribunal for Rwanda was in the order of US$ 270 million. The contrast to the AU budget for the African Human Rights Court, which in 2011 stood at US $6 million, is striking in the extreme. This is so because proof beyond reasonable doubt for very serious offences requires extensive fact-finding, presentation of extensive evidence, opportunities to question witnesses, careful assessment of evidence and lengthy judgments. International criminal tribunals co-exist with Offices of the Prosecutor, and further extend to issues as wide-ranging as witness protection and imprisonment. The International Criminal Law Section will consist of three chambers: a Pre-Trial Chamber, a Trial Chamber and an Appellate Chamber. In addition, a Victims and Witnesses Unit, Defence Counsel and Detention Management Unit are to be established within the Court’s Registry. Adding anextremely costly third section to the two-sectional Merged Court would therefore by necessity require a much greater investment of resources than those that had been allocated to the African Human Rights Court in the past. Also, the anticipated cost of the tri-sectional court would far exceed the cost of the Merged Court. The rationale of saving expenses seems to have disappeared. The addition of a very costly section, which would necessitate considerable strain on limited or non-existent resources, is either a ploy to create an institution that is designed to fail, or demonstrates a reckless disregard for actual functioning of the to-be-established institution. Through its very concerted attempts to create the tri-sectional court, the AU seems intent on establishing yet another institution that from the outset has been destined to become an empty and ineffectual shell. The negative impact of establishing such an institution would not only be brought to bear on the new section dealing with criminal justice, but is bound to affect the other parts of the court as well, including the section dealing with human rights. In the light of these negative effects on human rights of a three-section court, the following conclusion and strategy is offered: Whatever the arguments for or against an African court with jurisdiction over serious crimes, such jurisdiction should vest in a separate judicial entity, distinct from the two sectionsthat are foreseen under the Merged Court Protocol. The establishment of an African Court should not be allowed to cause a setback to existing human rights protection. The problems discussed above can be avoided only if the African Human Rights Court, or the future African Court of Justice and Human Rights, is allowed to exist or be established independently from any judicial institution dedicated to criminal justice. Such an approach would also avoid the legal driftsand on which the Amending Merged Court Protocol seems to be built. The question may beposed how a Protocol that is not yet in force can be amended. Legally speaking, the Merged Protocol can be ‘amended’ only once it has entered into force. These technical complexities can be avoided if the merged Court (consisting of two sections) and the African Criminal Court are treated as separate structures, each with its own distinct legal basis. One of the main reasons why the Amending Merged Protocol is such a maze of complexity, is the fact that it amends a treaty that is yet to come into legal being. However, if it is so that the train has already left the station, in the sense that there is little political appetite and no space to engage critically with the notion of a three-section court by reviewing the structural tripartite entity that has been foreseen in the Amending Merged Court Protocol, a number of concrete suggestions are made as to the improvement, from a human rights point of view, of the Amending Merged Court Protocol. The composition and role of the Appellate Chamber should be clarified. In providing this clarification, regard must be had to the fact that the human rights section alone should be competent to hear cases related to human and peoples’ rights as set out in article 7 in the current version of the Statute. The appellate chamber, consisting of judges without competence in human rights matters specifically, should not be placed in a position in which they could overrule the findings of the Human Rights Section of the Court. As the Protocol stands, the decisions of the Human Rights Section may be overturned by the Appellate Chamber of the International Criminal Section. Such a state of affairs would seriously undermine the autonomy the human rights section and its mandate. The title of the Protocol should at the very least identify the exact, tri-functional nature of the court, and should not merely and deceptively be called ‘African Court of Justice and Human and Peoples’ Rights’. This amendment to the title may be an appropriate to better represent the nature of the two-section Court (by adding ‘and Peoples’’ in line with the African Charter on Human and Peoples’ Rights and the naming of the current Court, the African Court of Human and Peoples’ Rights). However, the addition of a third section makes this name inappropriate, as it does not reflect the essence of the Amended Merged Court: The title should be ‘African Court of Justice, Human and Peoples’ Rights and International Criminal Justice/International Crimes’. An objection that this title is overly long or complicated merely underlines the true nature of the proposed court. A provision should be included to create the option for states to accept the jurisdiction of only the Human Rights and General Affairs Sections. The jurisdiction of the International Criminal Law Section should be optional rather than a necessary consequence of ratification. This possibility would address the concern that an all-or-nothing approach could deter some states from ratifying the Amending Merged Court Protocol. It should be kept in mind that there may be very little need for a separate court to ensure that effect is given to the numerous treaties of the AU dealing with aspects of good governance and human rights. Article 3 of the Protocol on the African Human Rights Court in its current form allows the Court to interpret all human rights treaties ratified by the states concerned. The concept ‘human rights treaties’ in this article should be interpreted broadly to encompass the instruments that are mentioned in the Amending Merged Court Protocol, such as the African Charter on Democracy, Elections and Governance. In other words, the argument that the African Section on International Criminal Justice needs to be established to give effect to or ‘operationalise’ those treaties does not really hold water. The extensive jurisdiction of the human rights court or section will go a long way to ensure that states are held accountable to the standards set out in these treaties. This contribution does not express a view about the suitability of an African Criminal Court, as such. The mainstay of the argument is that if such a judicial entity is to be created, it should – for the reasons outlined above — not be merged with the to-be-established African Court of Justice and Human Rights, but should be established as a separate court. However, if there is no political will to deviate from the set course, and a Protocol is adopted that would produce a court with a section on international criminal law, the acceptance of this section’s jurisdiction should be made optional. In arriving at the best solution, the AU should not haste to finality, but should engage in further consultation and discussion, and should make the process of this complex and potentially far-reaching legal instrument as inclusive as possible. Prof Frans Viljoen is Director of the Centre for Human Rights, Faculty of Law, University of Pretoria. He is also the academic co-ordinator of the LLM (Human Rights and Democratisation in Africa), presented by the Centre, in collaboration with twelve partner law faculties across Africa. He has published numerous articles dealing with international human rights law, and the book International human rights law in Africa (Oxford University Press, second edition, 2012). Thank you very much. Article 6 of the present draft indeed affects one of the points I have made in the original version of this blog article: the point that a state may have ‘second thoughts’, allowing it not to ratify the new version of the Protocol and in the process ‘undo’ its initial ratification (para (c) under ‘Negative effects of Amending Merged Protocol …’). If art 6 of the Amending Merged Protocol is adopted in its current form, the prior acceptance by a state of the jurisdiction of both the African Human Rights Court and the African Court of Justice and Human Rights cannot be ‘undone’, but is ‘preserved’. I take the liberty of adjusting the article slightly to incorporate this aspect. Very nice work as always sir. Attending at Georgetown law . The issue of political will to respect decisions looms large in all respect. Enforcement mechanism of decision is yet another and finally, financial commitment by member states are a sure pitfall for the new court. Nigeria is currently unable to pay Federal salaries and chaos is on; certainly funding of the merged court is worrisome. Why must we not support the ICC and see that impunity is brought to an end in our continent instead of going the way we are? How wrong will I be to assume that detractors of the ICC are using Africa as a laboratory to whittle down the pending audacity of the ICC? Very inspiring article especially for the promotion and protection of human rights in Africa. Experience and legal practice has indeed shown that there are indeed serious disparities between courts focusing on state responsibility and courts dealing with individual criminal responsibility. Courts dealing with state responsibility make findings about state responsibility, while courts focusing on criminal justice make findings centred on individual guilt. Another very important difference Prof Frans brings out is the evidentiary standards that apply in various courts. The standard in an international criminal tribunal is that of ‘beyond reasonable doubt’, while state responsibility is determined with allusion to the standard of a balance of probabilities. A very important point to underscore which would seriously affect the operation of the proposed Court. Let mechanisms of promoting human rights enforceability operate under a separate legally binding entity, while mechanisms of enforcing criminal justice operate under another entity. This is indeed a very interesting read. Thank you very much for your insight and must i say a very in depth analysis of the proposed ‘amended merged Court’. One thing though that i seem to differ with you on is the argument that appeals from the human and peoples’ chamber of the court will be heard by the appellate chamber. While i agree with you that the final document (that you have referred to) that was accepted by the meeting of ministers in May 2012 talks of only one appellate chamber, my reading of page exp/min/IV/rev 7 page 9 of the same document leads me to argue differently. Page 9 of the final version of this document has what reads as ‘article 18′ which indicates clearly what will happen to matters before the General Affairs chamber and the Human and Peoples’ chamber as regards revision and appeals. My assumption is that the ‘article 48′ referred to here is the same article 48 as in the 2008 Protocol on the Statute of the African Court of Justice and Human Rights. A reading of article 48 of this Protocol clearly indicates that the human and peoples’ court/ division/chamber shall not be involved in appeals of judgments but rather will ONLY revise a judgment if there is discovery of a new fact of such a nature as to be of a decisive fact. This is my interpretation of the new amended Protocol as regards appeals from the human rights chamber. In summary what am i saying? I clearly do agree with the argument propounded by Prof Frans in the fact that the drafters of the latest version of the Protocol need to clarify ‘ the appellate chamber’ reference on the same page but i also think that it is merely poor wording and that the first paragraph of the said article 18 is clear to indicate that certainly, judgments of the human rights division will not be appealed to the Appellate Chamber. Lastly, while Prof Viljoen’s article is not specifically on the Criminal Chamber of the Court, it would be interesting to note that the Criminal Chamber of the Court gives complementary to both national courts and Regional bodies such as ECOWAS..something that Dr Chacha Bhoke once asked in his article if possible under the ICC Rome Statute…mmhh…All in all, i could not have said the above arguments propounded by Prof Frans in a better way! Brilliant.